U.S. 23 extends just 37.9 miles south into the Sunshine State, mostly along shared alignments with U.S. 1 and 301. The route joins the Nassau County town of Callahan with Jacksonville to the south and Folkston, Georgia to the north. 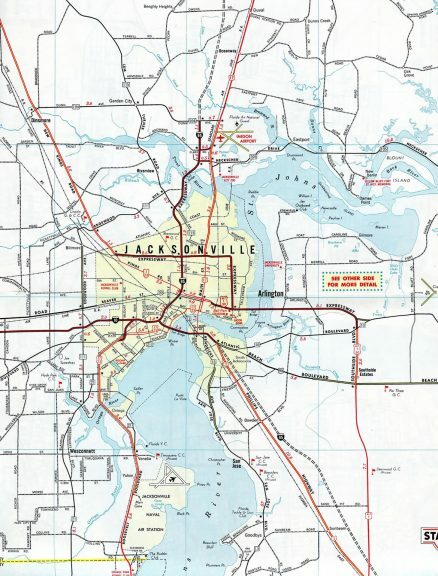 The 2.549 mile segment of U.S. 23 along New Kings Road and Kings Road through Grand Park and Mid Westside in Jacksonville represents the lone stand alone portion of the route in Florida. Prior to 2006, U.S. 23 ran solo from I-95 to U.S. 1 & 17 (Main / Ocean Streets) as well. That changed with the realignment of U.S. 17 to overlap with U.S. 23 along the couplet of State and Union Streets. 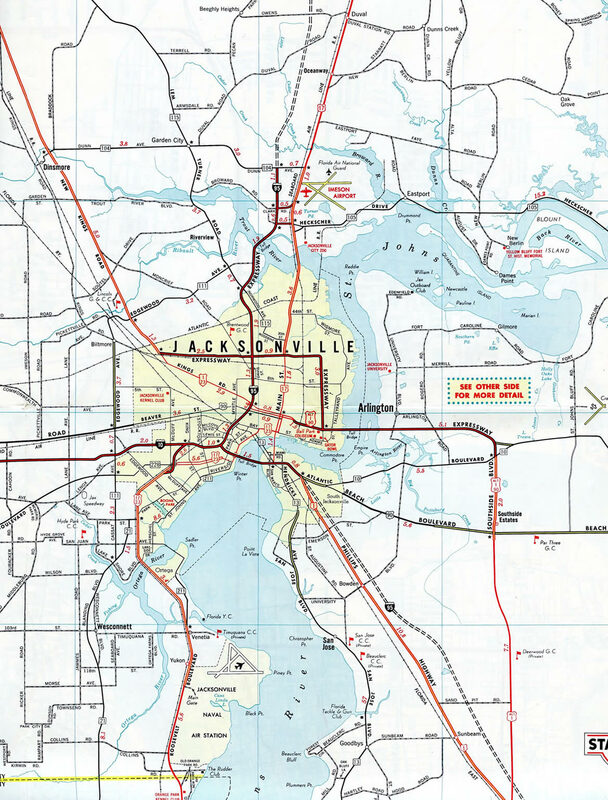 A General Drafting Map from 1964 showed U.S. 17 & 23 overlapping south from Jacksonville to Palatka. It appears that this was a cartographic error as the route was never posted south from Downtown. North into Georgia, U.S. 23 and SR 23 briefly overlap through Folkston. Georgia 23 previously formed a multi state route with Florida 23 leading south to Macclenny, Lake Butler and Gainesville. It was renumbered as part of multi state route 121 between Lebanon Station, Florida and Rock Hill, South Carolina. SR 23 in Florida was eventually reused for the First Coast Expressway. U.S. 17 north & Florida 228 east combine with U.S. 23 south as Union Street intersects Davis Street. Davis Street north to Kings Road provides northbound access to Interstate 95 for southbound motorists along U.S. 23. Photo taken 12/30/06. Florida 228 east separates from U.S. 17 north 0.6 miles ahead at U.S. 1 (Main Street) south. Trailblazers prepare motorists for the junction, though the U.S. 17 shield was removed in 2016. Photo taken 12/30/06. Jefferson Street flows south from Hogans Creek and Florida State College at Jacksonville to intersect Union Street at the next eastbound traffic light. Photo taken 12/30/06. Broad Street leads north from the end of Florida 13 and the Acosta Bridge to intersect U.S. 17 north, U.S. 23 south & Florida 228 at the subsequent signal. Photo taken 12/30/06. Clay Street travels four blocks south to the Duval County Courthouse complex at Duval Street. Photo taken 12/30/06. The First Baptist Church parking garage at Union and Pearl Streets features a light house replica. The garage is part of a nine square block campus, which includes a 10,000 seat auditorium. Photo taken 12/30/06. The Jacksonville Skyway passes overhead as Union Street east intersects Hogan Street. The people mover connects the adjacent Rosa L. Parks Transit Station with Downtown, the Convention Center and Riverplace. Photo taken 12/30/06. Traveling along side the First Baptist Church of Jacksonville, another set of shields direct motorists to the left for U.S. 17 north and right for SR 228 east. Photo taken 12/30/06. Florida 228 parts ways with U.S. 17 north & 23 south to join U.S. 1 (Main Street) south to Monroe Street in Downtown. U.S. 1 separates into a one-way couplet along Main Street south and Ocean Street north to the Main Street Bridge. Photo taken 12/30/06. U.S. 23 south concludes as U.S. 17 turns from Union Street onto U.S. 1 (Ocean Street) north. U.S. 1 & 17 overlap through Springfield to M.L. King, Jr. Parkway at Brentwood. Unsigned State Road 139 emerges from U.S. 23 ahead, joining SR 10A east to Arlington Expressway. Photo taken 12/30/06.